These table bases are perfect for all kinds of table tops. The base is weighted for extra stability and safety. There are three different height options to choose from, that are all delivered free of charge to any UK mainland address. The Jem four legged café table represents fantastic value for money and is one of our best selling café tables. The table requires self assembly and for larger projects we can provide a café furniture installation team as part of the service. The Jem 2 table is a slightly cheaper table with 3 legs instead of 4. This café table with only accept small cafe table tops. For rectangular café tables we also provide the Jem twin café table base. Bermuda café tables are 4 legs for extra stability. These chrome café tables are offered in three heights, dining height, poseur table height and coffee table height. Normal lead time for the Bermuda bistro table 3-5 days. 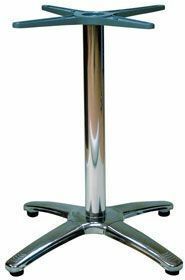 The TB100 series of chrome bistro tables with circular bases are also offered in 3 heights. The TB102 café table has an extra large circular base and is able to support table tops of up to 1050mm in diameter. The HK series of cast iron café tables represent fantastic value for money and are of a durable construction. The bases are weighted to add to the stability of the café table. As with the Jem table base these tables have a 3 and 4 leg option and the HK twin, a two leg café table for rectangular café table tops. The Bermuda series of cast iron café table are offered in 4 options with increasing sizes of feet depending of the size of café table required. The Bermuda 4 café table will take a maximum of 1100mm x 700mm rectangular top. We also have a number of café tables on offer on our special offer section. The Stylo cafe table is a small table with an ABS top suitable for indoor and outdoor use. The table is available with a black, white or silver plastic top for a rapid delivery. Finally Durham cast iron café bases are the cheapest café tables on line. We have large stocks of these tables in the 3 height options with free UK delivery for orders greater than 4 tables.